Comics In 5 Panels: Cartoon Month: Gravity Falls. It's summer, and the twins Dipper and Mabel are spending their vacation with their granduncle(or "Grunkle") Stan, a professional con man who runs the Mystery Shack, a tourist trap filled with fake oddities and a overpriced gift-shop. 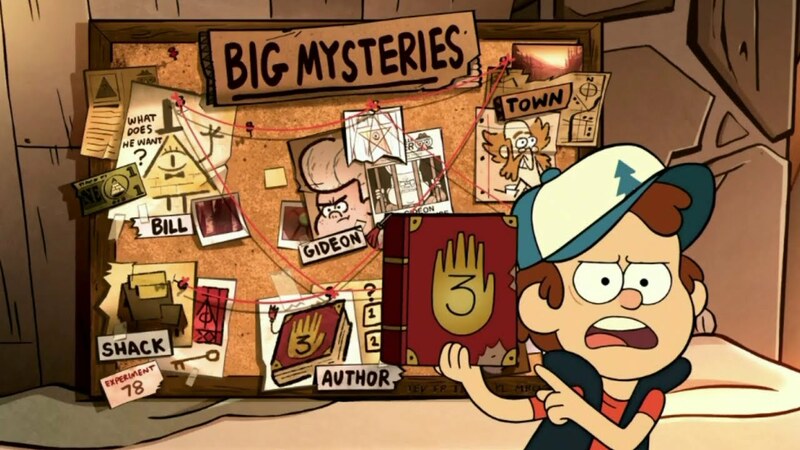 But after finding a old journal with the number 3 on it, the twins discovers that Gravity Falls apparently is the capital city for the paranormal. With the journal, the twins explore every inch of the weird little town, meeting all sorts of creatures, including gnomes, mermen, video-game characters and dinosaurs. It seems like this is going to be the most exiting summer in their life. Um... Try to imagine... The Simpsons for kids. The characters in the show are not unlikable, but they have plenty of flaws. Some of them are greedy, others unintelligent, some lazy, and some are just annoying. They are the people that you don't want to be with at first. But as we keep watching the show, notice the likable traits in even Grunkle Stan and that he may not be that bad an uncle, even if he is a lying, stealing, jerkish fraud. The humor in the show is pretty mean-spirited from time to time, but that is the beauty of it. There are plenty of third-stringer characters who provides humor by simply being stereotypes while others are... GOD knows what. The best example could be Tyler. Seriously, what is up with this guy?! What the heck is his deal?! Believe me, once you watch the show and see this guy for the first time, you will understand what I'm talking about. But let's not forget what this show is about: Monsters and mysteries. The weirdness and spookiness is varied. Some of the episodes are just weird(one word; Minigolf), while some of them are downright scary. Because of the changing level of weirdness, creepiness and so on, it takes you by surprise when you realize that you are watching a scary episode. One of the episodes is(without spoiling too much) about a very angry ghost who wish to avenge his friend who worked themselves to death for nothing. It's freaking creepy, as we see the graveyard... grow. There are also an ongoing story-line, since Dipper wish to find out WHO wrote the journal, and if there is a number 1 and 2 as well. The hunt for the Author is twisted and has many dead ends. And it seems like that they get all kinds of answers to everything else BUT The Author's true identity. So, like... Go watch it. Now! ASAP! Before ASAP!!! Travel back in time and watch it! GO!!! Next up; A boy and his three(or is it four?) moms. I JUST ADORE THIS SHOW!! This, for me, is the new "LOST" that countless live action series try to their best to become. Better yet, the new TWIN PEAKS. And it's funny. And animated! Who knew!?! Oh, I did! That episode explained so much.